Yes, remastering the Eskimo Roll was my New Years Resolution. My partner Jeff says that it takes about 100 rolls to have a "reliable eskimo roll." In January, I made an effort to do at least 3 rolls each time that I paddled. Of course being a perfectionist, this usually translated to 5 to 7 rolls. 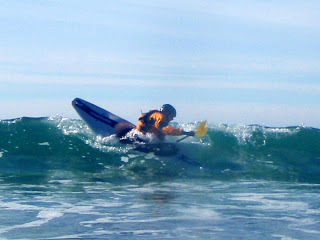 I would often ask for one of my paddling partners to spot me so that I could get an eskimo assist if I missed my rolls. They have been very supportive and encouraging. This week I hit my 100th roll since January 1st. So do I feel that I have mastered the roll? Yes, I am very confident in my on-side roll. Lately I have started kayak surfing in a decked kayak (which I never thought would be in my paddling scope) and am having a lot of fun rolling in the surf. Jeff tells me that rolling in warm water is even more fun. Our water here on the Mendocino Coast is usually in the mid-50's. It was quite a commitment to make myself roll in that chilly water, but it has helped me to get used to it so that I am not shocked by it when I do roll over. I definitely recommend learning the eskimo roll in a pool with an instructor, goggles, and nose plugs. We had several sessions last fall at the Fort Bragg Recreation Center swimming pool and are looking forward to teaching rolling this summer at the STARR Community Center - Fort Bragg's new aquatic center. Rolling on though, now it's time to work on the offside roll. I am Woman . . . hear me ROAR!!! I am a Woman of Water who plays in and on the water as much as possible and wants to share my experiences in this world of water with others. 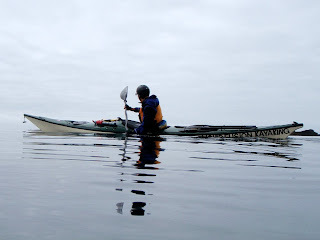 Exploring and playing on the water in a kayak is my current passion, but I am interested in all things to do with water and the sea. Share with me the adventure of being a Woman on Water.